Save time and money on airport parking at New York’s LaGuardia Airport (airport code LGA). Looking for JFK airport parking? Looking for Newark airport parking? There are more than half a dozen airport parking lots to choose from at LaGuardia airport. “Air Park“, “AviStar LaGuardia” and Dollar Airport Parking are some to choose from. 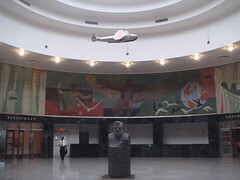 LaGuardia is located in Flushing, Queens, New York City. It is the smallest of the three area airports, and operates flights primarily in the United States and Canada. Delta Air Lines, American Airlines and US Airways have secondary hubs at LaGuardia, and the airport is served by a few dozen airlines. LaGuardia has lots of places to shop and eat in the various terminals. DVD rentals and sales, WiFi access and foreign currency exchange are also available. For up-to-date traffic information, check out NYC TMC here. Taxi: Taxis are plentiful in New York and frequent the airport. Rail: There is no direct rail line to LaGuardia. Bus/Shuttle: The M60 Bus (MTA-New York City Transit) runs from Manhattan to the airport, as do various shuttle services. Planning a long drive to or from the airport, or an odd-hours flight? Check out LaGuardia Airport (LGA) park and sleep hotels. Don’t fancy driving to the airport? Or leaving your car there and paying for parking? Catch a shuttle to LaGuardia airport.